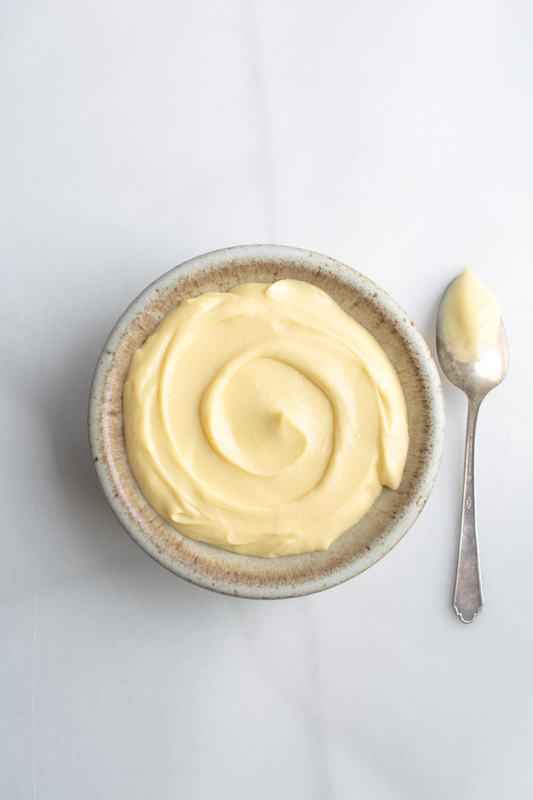 In my early cooking years I realized just how important it was to know how to make a velvety vanilla pastry cream. It’s so delicious and versatile. I purchased this beautiful book because I loved the cover. I was inspired by the colors and was intrigued with the idea of making cotton candy. Little did I know the recipes on the inside would become some of my favorites. Especially Gesine’s recipe for vanilla pastry cream. You will need 6 egg yolks. Do not throw away the egg whites. Egg whites can be frozen forever. 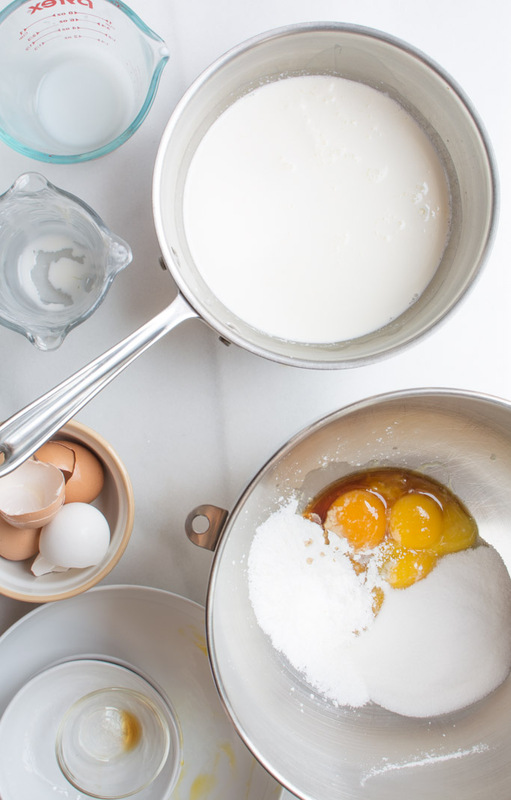 Thaw the egg whites to make Swiss meringue buttercream or macarons. 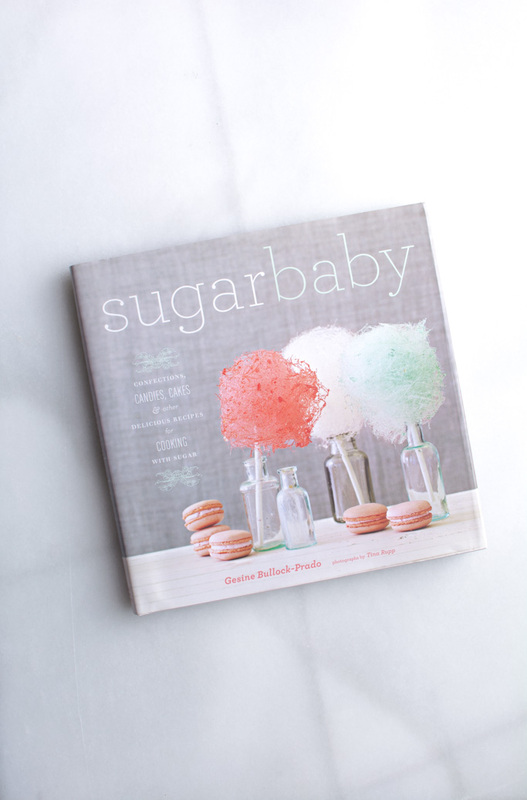 Getting back on track…you will need sugar, cornstarch, a pinch of salt, vanilla, milk, and cream. That’s it! 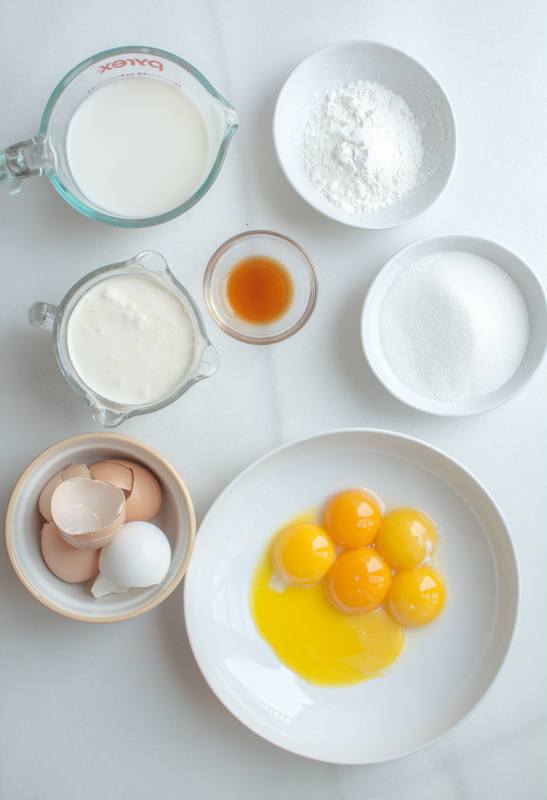 In the bowl of an electric mixer, with the whisk attachment, beat egg yolks, sugar, cornstarch vanilla and pinch of salt. Beat on high until the mixture is light and fluffy. Meanwhile, in a heavy saucier, mix milk and cream together. Place over medium-high heat and bring to a rolling boil. Decrease mixer speed to medium and slowly pour hot milk mixture down the side of the bowl. Lower the speed to prevent splashing, but you must add the milk mixture while the egg mixture is in motion because the hot mixture can scald the eggs. Once all of the milk has been added, slowly increase the speed and let it run for a minute. 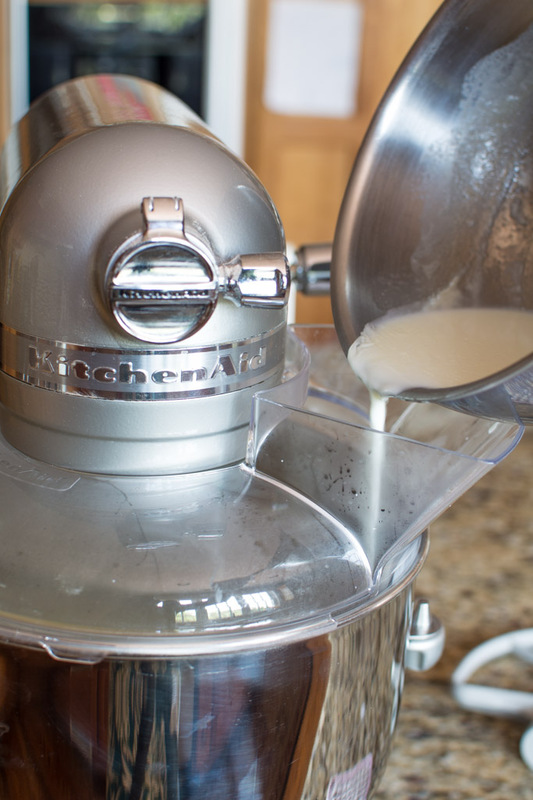 Stop the mixer and scrape down the sides and bottom to ensure all of the ingredients are completely incorporated. The mixture will be thin and foamy. 4. Before you start to cook the egg/milk mixture, have a clean bowl and a fine sieve ready. You will pour the thickened pastry cream through the sieve and into the bowl as soon as the mixture is done. 5. Wash the saucier well. Return the foamy egg/milk mixture back into the clean saucier. Return to the stove. Clip on a candy thermometer. Over medium high heat, vigorously whisk the mixture until it has thickened, 4-5 minutes. The mixture will get thick, but don’t stop whisking. Keep the mixture moving at all times. Make sure your whisk is getting the bottom and along the sides of the saucepan. Pastry ream can burn easily. 6. Once the mixture has reached 160F degrees, or looks like mayonnaise, remove from the heat and immediately pour through the sieve. 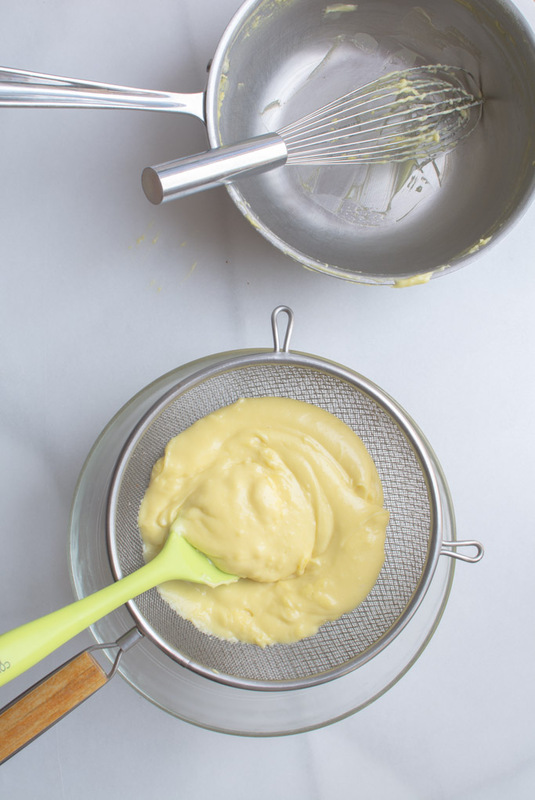 Use a rubber spatula to speed the process along by pressing the pastry cream through the sieve. 7. Take a piece of plastic wrap that’s larger in diameter than your bowl and place it directly on the surface of the pastry cream. Make sure that every last bit of the pastry cream is touching the plastic. Transfer the bowl to the refrigerator to cool completely. As the vanilla pastry cream cools it will be thicker. I can just imagine a bowl full vanilla pastry cream covered with raspberries, blackberries, blueberries, or PEACHES! While it could be eaten by the spoonful, it’s so much more than just a pudding. Velvety vanilla pastry cream can be used as a filling for eclairs, tarts, cupcakes, and layered cakes. It can be frozen into a luscious ice cream or mixed in with a pie filling and baked OR just eat vanilla pastry cream with a spoon! Rich and creamy pastry cream. Used for filling eclairs, tarts, cakes, pies, frozen custard and more. 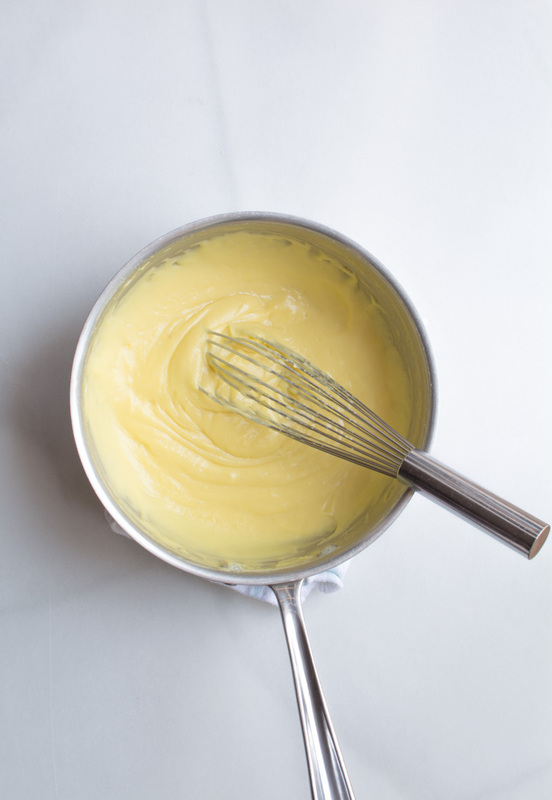 Place egg yolks, sugar, cornstarch, vanilla extract, and salt in the bowl of an electric mixer with a whisk attachment. Beat the mixture on high until light and fluffy. Meanwhile, in a heavy saucier, mix the milk and cream together. Place the saucier over medium-high heat and bring the mixture to a rolling boil. 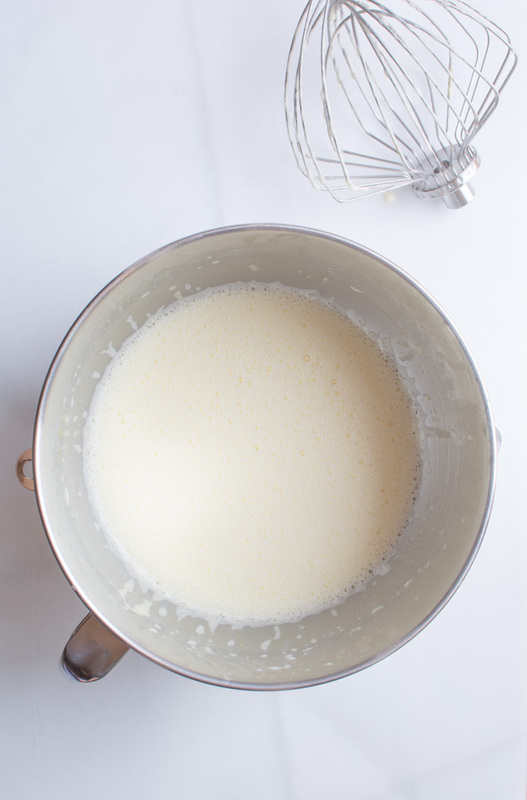 Decrease the mixer speed to medium and carefully pour the hot milk mixture down the side of the bowl. Turn the mixer to low to prevent splashing. The egg mixture must be in motion to prevent the hot liquid from scalding the eggs. Clean the saucier. It needs to be perfectly clean to be reused again to cook the pastry cream. Before cooking the then pastry cream mixture, have a clean bowl and a fine sieve ready. You will be pouring the finished mixture through the sieve and into the bowl the moment the mixture is done. Return the saucier to the stove. Have a candy thermometer ready. 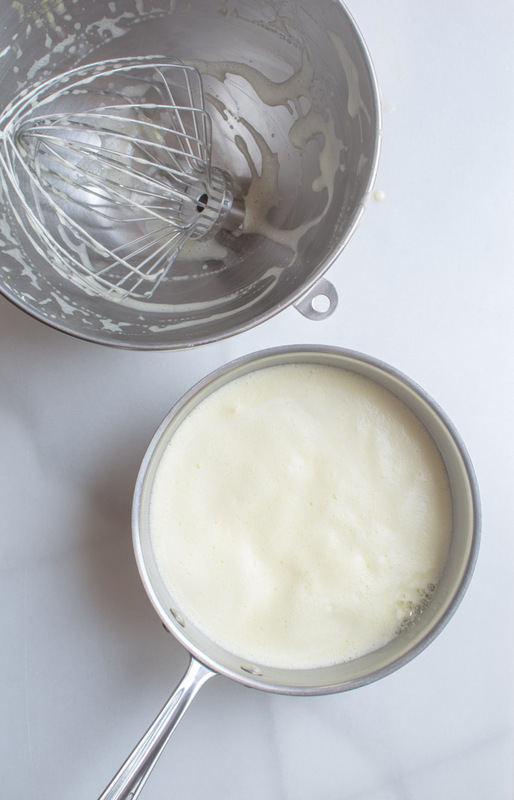 Over medium-high heat, vigorously whisk the mixture until it has thickened, 4-5 minutes. 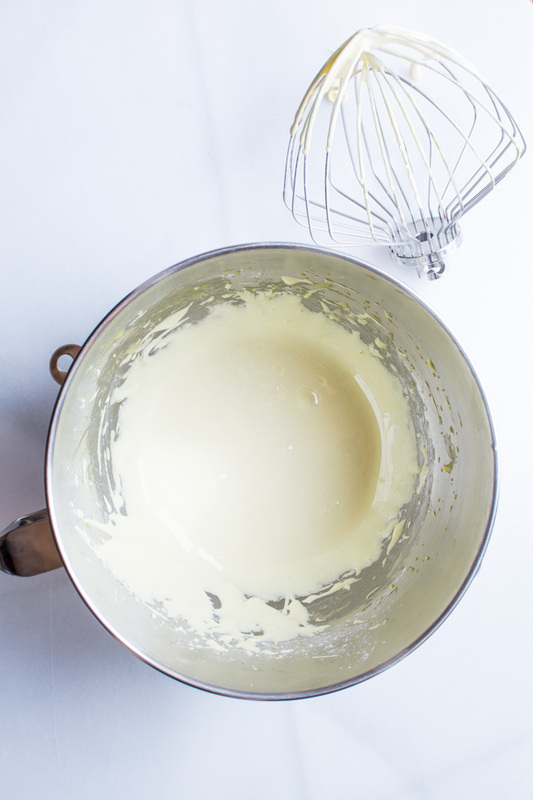 Don't ever stop mixing and make sure your whisk is getting to the bottom and along the sides of the saucepan. Pastry cream can burn easily. 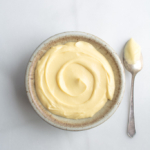 Once the temperature reaches 160 degrees and has the consistency of mayonnaise, remove from heat and pour the pastry cream through the sieve into a clean bowl. 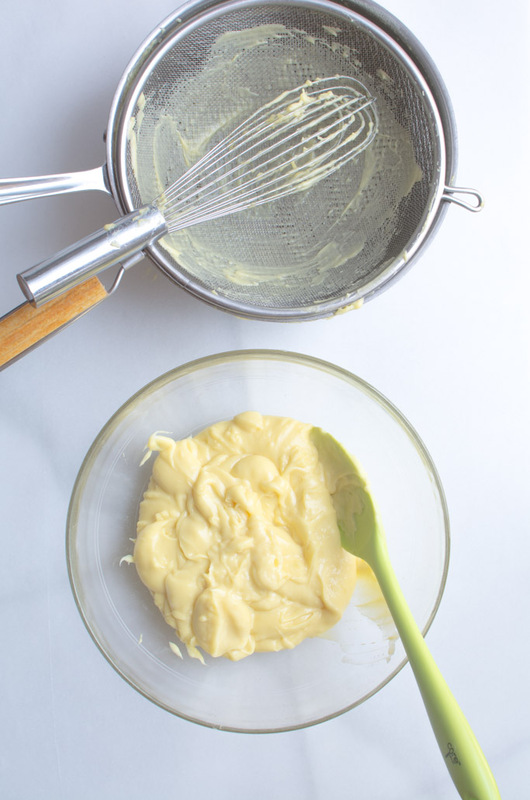 Use a rubber spatula to press the thick pastry cream through the sieve. Take a piece of plastic wrap that is larger than in diameter than your bowl and place it directly on the surface of the pastry cream. 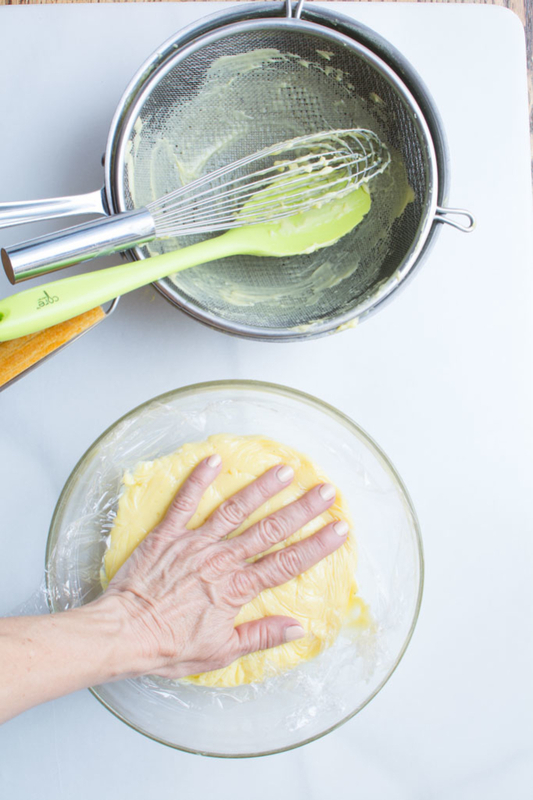 Make sure that every bit of pastry cream is touching the plastic to prevent a skin from forming. Transfer bowl to the refrigerator to cool completely. Once your pastry cream is cool, you'll notice that it's considerable thicker than when you saw it last. This is normal. Pastry cream keeps for about 2 days in the refrigerator. Many flavors can be added to pastry cream. Almond extract, espresso powder, chocolate ganache, lemon curd, pumpkin puree, etc. 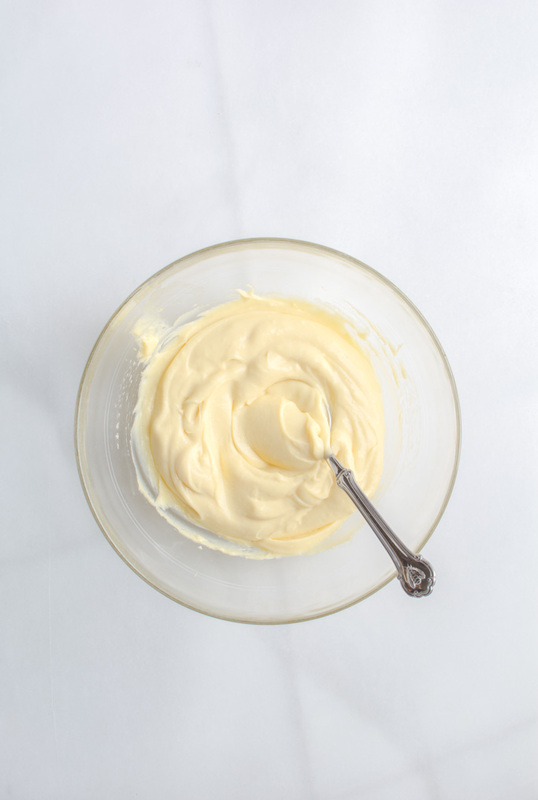 Pastry cream can be lightened up by folding 1/2 cup whipped cream to 1 cup pastry cream. THis was a lot easier to make than I thought it would be. So delish.